Former Indian President Dr. A.P.J Abdul Kalam had visited Koodankulam Nuclear power plant (KNPP) in Tirunelveli district of Tamil Nadu, India. And, Kalam had expressed satisfaction about the Safety of the Nuclear Plant after having detailed discussion with KNPP officials and inspecting the safety features of the plant. "I am completely satisfied. I am happy to see such safety measures. I am happy that this reactor will be safe to all the people around the plant," Kalam told reporters after inspecting the plant. 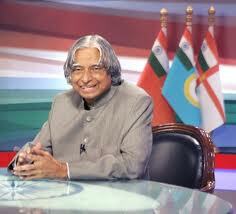 "The third generation nuclear reactor is totally safe and is a boon to the people," Kalam added. He said electricity is necessary for India's economic growth. Asked if he suspected whether 'foreign missionaries' were instigating the locals against the plant, Kalam said, "My great teachers have taught me not to suspect any person." 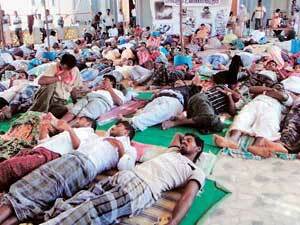 Meanwhile, an official of the anti-nuclear movement said they are not willing to have dialogue with Kalam on the issue. Kalam asks below question to the people who oppose this Nuclear plant. And, Kalam suggests a 10-point Kudankulam PURA (Providing Urban Amenities in Rural Areas) programme. Four-lane highways, a mega desalination plant, construction of houses, schools, hospitals as well as cold storages are amongst the suggestions to the Indian government made by Kalam for the development of Kudankulam and surrounding areas. Abdul Kalam explains the importance/need for Nuclear plants by giving below details. Nuclear Plants use Type-1 fuel, which is hundreds of thousands, if not millions, of times more powerful than the conventional Type-0 fuels, which are basically dead plants and animals existing in the form of coal, petroleum, natural gas and other forms of fossil fuel. i-e Few Bags of naturally occurring Thorium (Type-1 Fuel) can generate same amount of energy generated by Tonnes of Coal (Type-0 fuel). Energy is the most fundamental requirement of every society or nation as it progresses through the ladder of development. There is a distinct and categorical correlation between the energy consumption and income of a nation — each reinforcing the other. India sees rapid economic growth after liberalization. All this economic growth will need massive energy. Germany's decision about phasing out Nuclear plants should not be compared with India's Nuclear plans. Because, Germany is a power-surplus nation, and they had to import Uranium if they want to continue the Nuclear plants. India, on the other hand, is the leader of the new resource of nuclear fuel called Thorium, which is considered to be the nuclear fuel of the future. A study indicates that most of the prosperous nations are extracting about 30-40 per cent of power from nuclear power and it constitutes a significant part of their clean energy portfolio, reducing the burden of combating climate change and the health hazards associated with pollution. Solar and wind power, despite all their advantages, are not stable and are dependent excessively on weather and sunshine conditions. Nuclear power, on the other hand, provides a relatively clean, high-density source of reliable energy with an international presence. Today, there are 29 countries operating 441 nuclear power plants, with a total capacity of about 375 GW(e). The industry now has more than 14,000 reactor-years of experience. Sixty more units, with a total target capacity of 58.6 GW, were under construction. We should not compare a nuclear bomb with a nuclear plant. The bomb is designed to deliver a large amount of energy over a very short period of time, leading to explosions, firestorms and massive heat energy generated to obliterate every object in its path. That is what a bomb is supposed to do! Civilian nuclear applications in the form of a power plant, on the other hand, are designed to deliver small amounts of energy in a sustainable manner over a far larger time frame. It is designed with systems to control and cool the nuclear reaction. There are safety procedures and back-ups. At Tsunami-affected Japan's Fukushima-Daiichi plant, there was no direct loss of life due to the accident or during the operation in its aftermath to contain it. But according to WHO, about 1.3 million people lose their lives as a result of urban outdoor air pollution which is a direct consequence of electricity generation requirements. Comparing to Flight and Ship Accidents, Nuclear plant accidents are rare. Even those rare Nuclear accidents can be avoided in future due to the rapid development of Technologies. Coal mine fires cause huge loss to Life and Property. While radiation due to a nuclear disaster is dangerous, it would amount to wrong propaganda to state that nuclear disasters will affect generations to come. 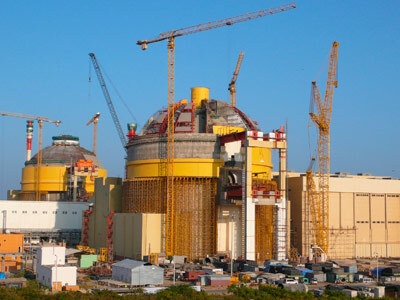 India's nuclear power plant operator NPCIL is building two 1,000 MW nuclear power reactors with Russian technology and equipment in Kudankulam. The first unit is expected to go on stream in December. The project is estimated to cost around Rs.13,160 crore (over $2.5 billion). But, thousands of protesters and villagers living around the plant, are blocking highways and staging hunger strikes, preventing further construction work, demanding closure of this plant, as they believe that the nuclear plant is unsafe. The Indian Government has already set up a 15-member expert committee to clear "misconceptions" about the project. Apart from being a notable scientist and engineer, Dr. A. P. J. Abdul Kalam has served as the 11th President of India from 2002 to 2007. APJ Abdul Kalam is a man of vision, who is always full of ideas aimed at the development of the country. He firmly believes that India needs to play a more assertive role in international relations. Dr. Kalam had received honorary doctorates from 30 universities and institutions, and he is the recipient of many awards including India’s highest award Bharath Ratna. People especially Students love and respect Kalam so much. Quotes of Abdul Kalam will be inspiring and Motivational. Kalam has proposed a research program for developing bio-implants and Space solar power. And, you can join the discussion of Nuclear Energy here. Find below the various Comments/Reply from various people across the world for the Question "Do you support Nuclear Power Plants?" Nuclear (fission) power is carbon neutral and if done right (not the way the US does it) has less waste material per unit energy than ANY carbon based fuel. In my opinion the only better alternative is nuclear fusion power which we don't have yet. I am from the USA, and I fully support nuclear power. Breeder reactors (where you get more fuel than you put in) are even harder to build due to added security concerns that are raised when you produce weapons-grade plutonium, so many politically viable nuclear power plant designs are less efficient and 'dirtier'. The problem where nuclear waste will last 10,000 years? Why is that stuff so dangerous and for so long? Because it's giving off radiation, aka energy, and here's a lot of it, which is why it's so dangerous and for so long - yet we call it waste and need to hide it away. Breeder reactors + nuclear waste reprocessing = waste that is nowhere near as dirty (it's still not clean by any measure - but it's a damn sight cleaner), but the problem is weaponizable nuclear material exists somewhere in that chain, and the US wants as little of that stuff floating around as possible. Not unreasonable, but 'waste that lasts 10,000 years' isn't an unsolved problem in nuclear physics. I am also in the US and favor nuclear power. I am a big proponent for nuclear power plants. The craziest thing about it, in the USA at least, is how they've turned environmentalists against it! You'd think that they'd be amongst the staunchest supporters. I don't mean to be a pedant, but I must LOL every time I see someone misuse the word "critical". When a reactor is "critical", the number of neutrons created from fission that go on to create another fission on average is equal to 1. In other words, reactor power is constant and self-sustaining. It is not a bad thing. On the contrary, it is quite normal for a reactor to be "critical". And if you look into wind power, it's no just the inconsistent power output that is an issue. They do in fact put a toll on the environment, though much more subtly. Can anyone honestly say that the relativity short life of a wind farm, coupled with incredibly high cost of production, is worth the end result? Im not saying they are the devil incarnate, im just trying to point out that they are very cost ineffective compared to other renewable energy sources. Plus I support nuclear power and hate to see efforts in that field get scaled back. Anytime we climbed a tower in a field of wind turbines there were dead birds every where. Ideally I want Solar and Wind to replace coal. Unfortunately we can't do that right now for the many reasons, so I support Nuclear, Solar and Wind replacing Coal. Yes, I'm from the US. Coal kills an estimated 1 million people annually, and natural gas/oil are also way up there. Nuclear is far safer than fossil fuels, but because deaths occur in one massive burst, its dangers are more noticeable. Nobody notices the thousands of people who die from coal-related breathing disorders though, since they die quietly in hospitals. IIRC, it's also safer than hydroelectric if people live below the dam. Obviously sustainable choices (solar, geothermal, wind) are better for human safety, but unfortunately they don't have the capacity to provide for 100% of our energy needs. Nuclear can fill the gap. Fusion would be safer than current technology, and with much less nuclear waste, so I think we should push research on fusion. More deaths have come from coal than nuclear even including Japan, and coal waste is surprisingly more radioactive (larger amounts)than nuclear. Yeah, the problem w/ solar and wind right now is storage for times when there isn't wind or sunlight. That's why nuclear is the best option (at the moment) because it can produce a stream of power that doesn't fluctuate (much) and with very little waste with new reactors. It supports me. Nuclear power is by far the most efficient source of "clean energy." It raw dogs the other alternatives by far. I'd rather have that than coal burnoff but I'm American, if it seems good to go at first glance, "Awesome," sort the details later. Nuke plants are fine depending on the age/type and maintenance. I very much support nuclear energy and therefore power plants, just make sure they aren't built around areas that are prone to earthquakes or tsunamis. I personally support them, but as an undergraduate process engineer I've been somewhat taught that they are the future. They have several pro's and con's but are probably the most realistic option in what people understand as sustainable. The most important fact to remember is that they are available now as a carbon neutral (in the sense that the general public understands it) source of power, and they can actually provide a realistic amount of the worlds energy requirements. Wind is pretty much useless on a large scale, and the amount of solar panels it would take to power a large city is unrealistic. Uranium comes from mostly from Canada and Russia, making it more reliable than middle eastern based oil sources. (most US oil comes from North and South America, but I'm from the UK). I have lived in a town with a nuclear power plant my entire life (Ohio, USA) and I can see no downside to it. It helps the economy (helps pay for a multi-million-dollar, public school AND gives countless jobs to the community) and really causes no problems. Sure, there was a scare during 9/11, and that was somewhat terrifying (especially being a youngin'), but other than that I have full confidence in it. My house is maybe a three minute drive from being right in front of the facility's gates (I can run there, and frequently do during workouts, in 10-15 minutes), and honestly seeing it when I come home from college (or anywhere for that matter) reminds me that I'm home. In my mind, I see no problems with them, and the community embraces it as well. But hey, that's just my two cents. I'm open to any questions that people might have about them and will try to answer questions to the best of my ability! Nuclear Power Plants are better than other power plants - it is that easy of a sweeping generalization. Fact. Building Nuclear Power Plants near sea level, near the coast, with backup generators at ground level was the problem with Fukushima. Nuclear Power was not to blame for what happened. There is so much better Nuclear technology available now than there was when most of our plants were built. I think nuclear power plants are a great idea. However, I think that the greedy, lying, low-balling, corner-cutting, regulation-setting-and-ignoring corporations that run nuclear power plants are a nearly insurmountable problem. I do support nuclear power plants. Currently, there isn't a good enough generation source which provides the base line that nuclear does. Yes, you could supplement that loss with extra CCGTs, or coal plants, but then there's the added CO2. And replacing them with renewable sources would take a massive investment, and plus, frequency stabilisation will be much much harder without any big generations on the grid. And with the Japan Tsunami disaster, i havent looked into specifics that much, but wasnt the Fukushima-Daiichi plant built on a fault line? This isnt a good enough reason to just blanket ban nuclear power really. I fully support nuclear energy. I actually did a paper on this subject. The big thing with solar energy is that it is pretty damn expensive to start up, and it takes up a LOT of room, just like wind energy. And nobody wants all of those solar panels or wind turbines in their backyard. Coal kills people as well, just like nuclear, but whether it is from the mining of it, or just the emissions, it does. The downside to nuclear energy right now is that it is expensive to start up a new plant, so we keep using our old ones, which are built by oceans for the water supply to cool the reactors. Technology has become sufficient enough that we don't need to have the plants near an ocean, nor do I think we even need them near a river. So the threat of a tsunami wipeout can be reduced to nothing if we moved inland with them. Not all places can do this though like Japan. The other issue is the nuclear waste, but that is being worked on. They are finding ways to reduce the amount of waste produced, and I believe that they are working on a way to be able to re-use spent fuel rods. I just researched this a year ago, things may have progressed or changed since then, but I will be for nuclear energy. I am in the United States. Of course. It's safe, clean, & efficient, what's not to support? If every single nuclear reactor in the US blew up and killed as many people a Chernobyl did, there would still be more deaths in a month caused by air pollution from burning fossil fuels. I am always in favor on Nuclear power, if it is properly maintained and managed it can be a amazing power source. I support Nucelar Power, and am from the USA. In my particular region, most people oppose it because they don't understand the mechanisms or even statistics. They also oppose hydroelectric dams and wind power because of the damage they do to the environment. They love solar power, but unfortunately, we have rain/overcast for about 9-10 months out of the year. I would personally sooner live 3 miles from a Nuclear Plant than 3 miles from a Coal Fired Plant, statistically much more dangerous in the latter case. I fully support them. What is funny is that I have yet to meet someone with a degree in engineering, and more specifically nuclear engineering, that does not. People against the nuclear energy often have not a clue of what they are talking about. There are risks associated with nuclear power plants, but these risks are overstated. A modern built plant would be significantly safer. I fully support fission reactors, despite their faults. I don't think the current state of affairs is sustainable forever, and welcome the creation of molten salt reactors if/when they are implemented. I would love to see all of the old plants disabled and torn down in favor of newer, safer models as soon as possible, though. I work at a plant in the US. I'm comfortable with them. Nuclear energy is currently the safest method and most environmentally friendly method of producing energy. It has the least amount of dead people per GWh of produced energy factoring in all the accidents and including solar, wind and hydro to the comparison. It is still rather long term sustainable and with thorium the future looks good. Coal power plants for example produce much more radiation than nuclear plants due to radioactive isotopes in the coal. Yes, because it is much safer than coal (13,000 people every year die from power plants, whereas 4,000 people died from Chernobyl, ignoring cancer deaths). In addition, the recent meltdown was due to an abnormally large earthquake: the plant was designed to handle up to a magnitude 8 earthquake.